Forcing Molly to accept the new kid one day at a time.I returned from 16 long, exhausting days in Las Vegas covering the Wrangler National Finals Rodeo and went straight to my own horses. Winchester had been living the good life under the care of my dad while I was gone, trying to befriend our family horses but finding more acceptance among the goats and barn cats, mostly standing around eating hay for a month. I loved the daily texts from my dad assuring me he was okay and getting plenty of love, that he hadn’t strung a leg through the fence or gotten into a career-ending skirmish with my sassy red mare, Molly. I grabbed a lunge rope and off we went, Molly standing quietly at the trailer, hind leg cocked, watching the new kid making a spectacle. To preface the next 10 minutes, Winchester definitely has his baby moments, but he’s really an old man at heart. Quiet, a thinker, seems dead-on-the-outside, never panics, would rather sleep, kinda-sorta half-bucked once and never did it again, has never blown up, just wants to cuddle, is the sweetest, most passive animal and lowest in the pecking order anywhere he goes—anyone who has been around him for a few minutes can testify. Well, that day was his time to act like a typical colt that had been turned out for a month. Before I Winchester’s favorite pasttime.even had the lunge rope uncoiled, he pinned his ears, kicked out, hit the end of the rope and took off bucking circles around me like an NFR bronc horse. I had to laugh it was so out of character. I just stared at him like the emoji with the wide eyes and red cheeks thinking “Who IS this horse? !” and praising the Lord I hadn’t gotten on him. He would have absolutely LAUNCHED me. Winchester is big, athletic and powerful—it was truly amazing to watch him. I stepped toward him to change direction, and he sat back on his hocks and went up in the air with some Lone Ranger Hy-O Silver foolery, spun away and bucked the opposite direction for five more minutes. Then he just stopped, dropped his head, walked over and nuzzled me on the chest like the snuggly teddy bear we all know and love. ‘Okay, I’m done playing.’ I hugged his face and tied him back up, and he stood quietly. Just had to get it out of his system. A couple weeks later after the holidays, I got both horses settled back in Fort Worth and on a normal routine. I went to ride Winchester for the first time since Thanksgiving and was prepared to be tearing around the arena like Wade Sundell. I had also heard from many horsemen that 2-year-olds turned out for the winter come back much better in the spring of their 3-year-old year. The latter was the case for mine. Getting Winchester back under saddle went nothing like his debut as a bucking horse on the lungeline. The second day, we were trotting around the pasture on a loose rein. Winchester is riding around almost like a finished horse now instead of a colt. He ‘gets’ it, and the pieces of the puzzle are all coming together in his mind. The break was good for him, some time to relax, be a horse, grow up, and mature mentally—and physically. Seriously, he’s huge now. I learned a lot about Winchester from the winter break, too—that horse sure knows the difference between work and play. As soon as I throw a saddle on his back, he cuts the silliness and is ready to learn. I love that about him. He makes every day exciting for me, and I can feel myself learning and improving as a horsewoman every minute I spend with him. The future has never looked brighter, and I can’t wait to see what we can accomplish together. BHN associate editor Blanche Schaefer. Photo by Abigail Boatwright.Blanche Schaefer is associate editor of Barrel Horse News. She joined the team in August 2016 after graduating from The University of Texas at Austin with a public relations degree and a business minor. She found herself right at home in Fort Worth, Texas, at the BHN office, combining her love of horses, journalism, rodeo and barrel racing. A Texas native, Blanche was raised on a ranch in the small town of Vanderpool until she moved to Austin for college. She grew up riding and competing in 4-H and youth rodeos with her two geldings, Amigo and Petey, and then local amateur and open pro rodeos throughout high school and college with her mare and current main mount, Angel Flipper (“Red Molly”). She also rode English for the Texas Equestrian Team in college, competing in equitation through the Intercollegiate Horse Show Association and in the hunters on the local show circuit in Austin. 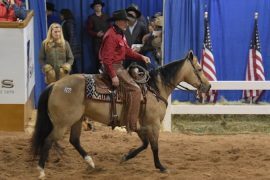 She is now focusing on her first futurity prospect, 2015 gelding Dashaway Ta Fame (Firewater Ta Fame x Dashawayawinner x Runaway Winner), the topic of her “What Do We Do Now?” blog series.